Referring to marine travel lift, we have to say that with the rapid and stable development of our economy, the quality of life of people has been continuously improved. People are more willing to spend more money on tourism, and more and more people are willing to choose to travel in a boat to enjoy the beauty of nature; or ride a yacht, and appreciate China and even the world’s excellent rivers and mountains to relax themselves. Yacht, as a kind of advanced durable consumer goods for water entertainment, integrates navigation, sports, entertainment, leisure and other functions to meet the needs of individuals and families to enjoy life in developed countries. 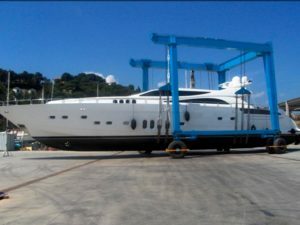 Yachts, like cars, are mostly privately owned. While in developing countries, yachts are mostly used as parks, tourist attractions for people to consume, and a small number as port wardens and public security officers. The essential feature of pleasure craft as a mean of entertainment distinguishes it from high-speed ships and tourist ships as a means of transport. Yachts will be the same as cars to become the next generation of consumer durable into the home. As a result, boats with different sizes have sprung up and the number of yachts has gradually increased. Naturally, travel lifts with different tonnages have also been born and the number has risen sharply. What is the travel lift? 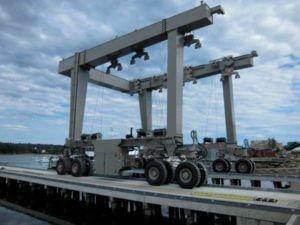 Travel lift is a kind of lifting equipment for carrying boats, vessels, and yachts, etc. It is widely used in yacht club and water sports training center for the convenience of maintenance, repair and other work. 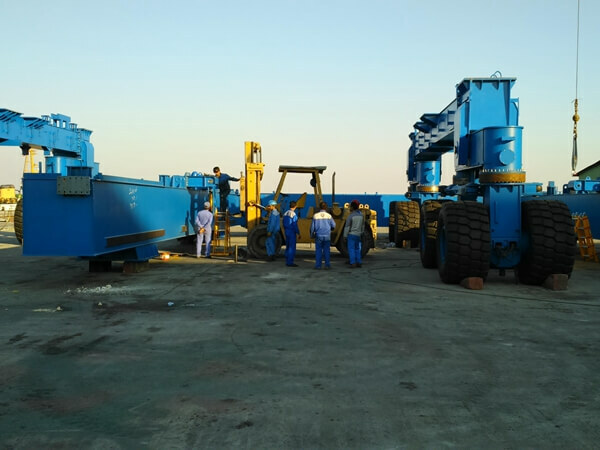 What’s more, it is widely used for Water Recreation Center, ship repair works, military bases, port terminals and other places of large lifting transport equipment. 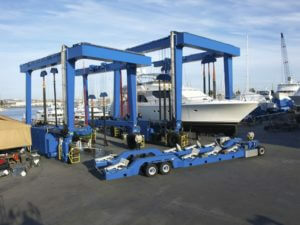 Marine lift is widely used in foreign countries, especially in the professional yacht dock or yacht club. 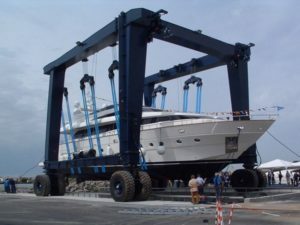 Because of its simple operation, convenient maintenance, the characteristics of flexible movement, the marine lift is a key lifting and handling equipment for large yacht or vessel out of the water and going into the storage, with high safety and reliability. 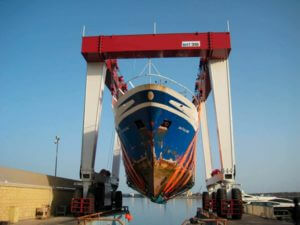 Marine boat lifts are also efficient and fast tools for companies of professional maintenance. 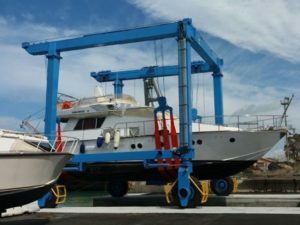 the maintenance cost for yacht users are saved and the efficiency and benefit are improved for users by marine boat trail lifts. 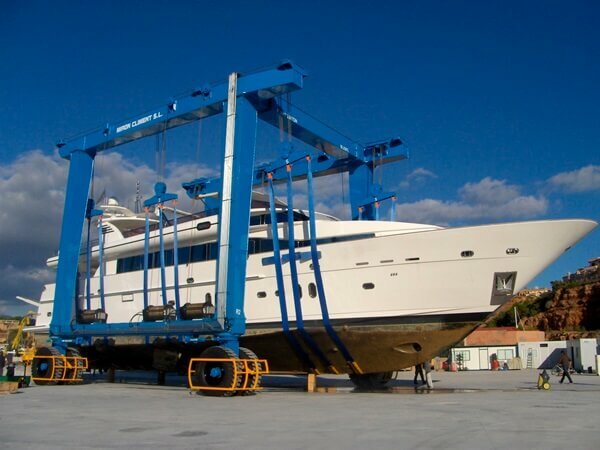 With the gradual development of China’s yacht industry, it is believed that the marine travel hoist, in the near future, will be widely used in various professional marinas. 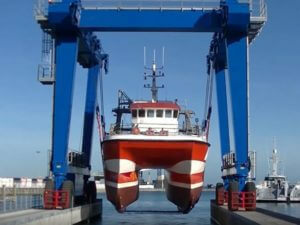 First of all , because of the different types of boats and vessels , their weight is different. Secondly, they differ greatly from their use. And their use environments vary widely. 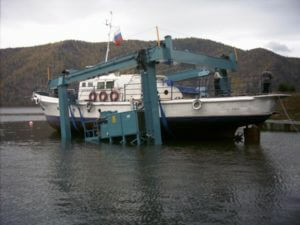 As a result, the capacity is different from boat lifts. 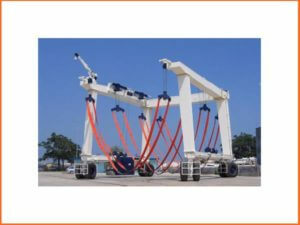 Fully hydraulic marine travel trailer lift, developed and manufactured by Ellsen, is widely used in yachts, water sports training centers and water entertainment centers, dockyards, military bases, ports and terminals and other places. 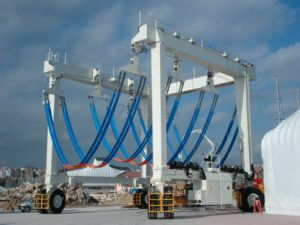 Lifting weight of marine travel hoist is from 25 ton to 600 ton. Components of travel lift mainly include the door frame, lifting mechanism, lifting point adjusting mechanism, operation mechanism and steering mechanism, electrical control system, power part, hydraulic system and safety protection device and so on. 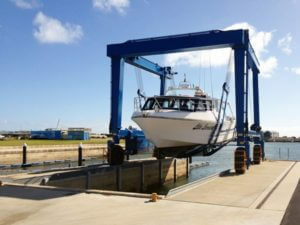 The door frame of marine boat lift adopts the “C” structure to facilitate the smooth handling of yachts, boats, etc. 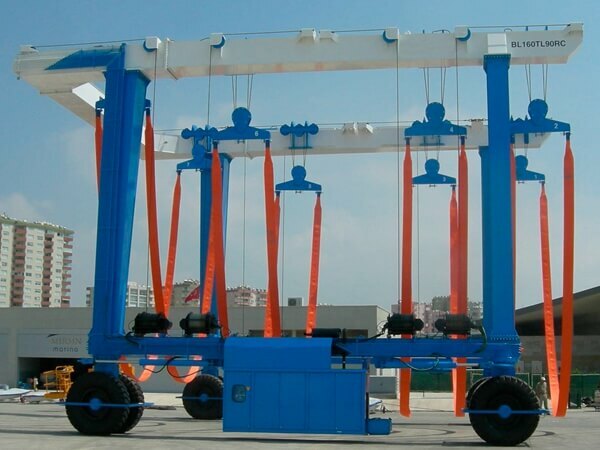 The main beam and end beam of the boat hoist adopt semi-steel and semi-flexible structure to effectively release the torsional stress of the portal frame. The door frame of marine boat trailer lift adopts 3d design to optimize the design.The hoisting structure of marine boat trailer hoist mainly consists of hydraulic winch, steel wire rope, pulley block, hoisting belt, fixed trolley, mobile car and so on. 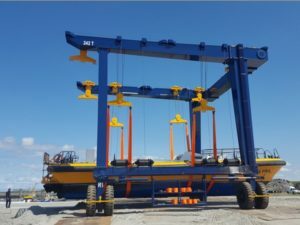 Travel lift uses multiple lifting points, and each lifting point can be lifted simultaneously or separately, which can automatically meet the lifting requirements of ships of different widths. 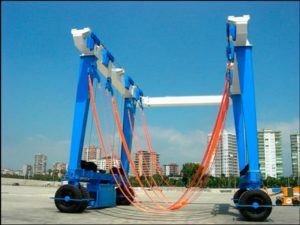 In addition, the lifting point shift structure of marine hoist can be adjusted flexibly to meet the lifting requirements of different length boats. 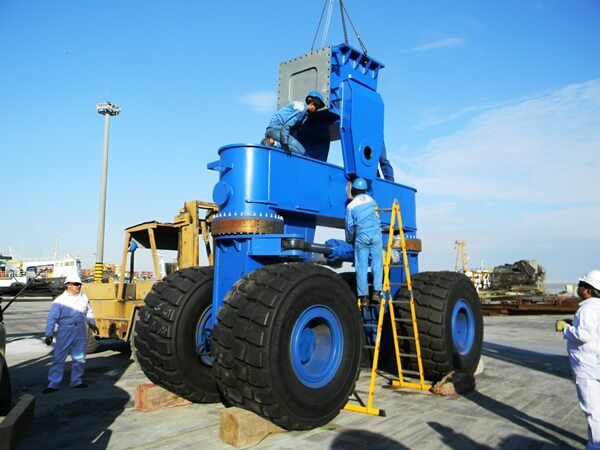 The walking structure of marine lift mainly consists of tire, hydraulic motor, reducer, axle and other parts, which can adapt to different road conditions such as cement, sand and dirt road. Moreover, it has a strong ability of climbing , with running smoothly and without impact. 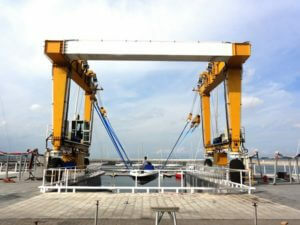 Marine boat lift is flexible and has many different steering modes, such as bidirectional straight line, bidirectional oblique line, bidirectional in-situ rotation, bidirectional steering, head swing, tail swing, and bidirectional “eight” turn, etc. 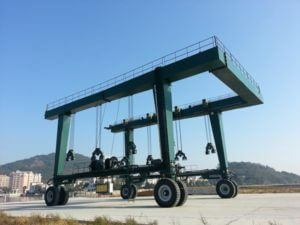 The electric control system of Travel lift adopts “CAN” bussing technology. Many kinds of sensors are located with high precision, and many kinds of control methods such as remote control and control room are adopted, which make the operation convenient and reliable. Its power and hydraulic system is mainly composed of engine set, generator set, hydraulic station group. With its own power, it can work all the time, so as to meet the user’s requirements in the maximum extent. The most important thing is that it has a load protection, stall protection, lost pressure protection, anti-skid protection, hydraulic lock and unlock, body emergency stop, safety brake protection, brake failure protection, acoustooptic alarm, engine abnormal alarm, hydraulic pressure system abnormal alarm and other multiple safety protection devices to ensure the safety of the whole operation, running and other processes. 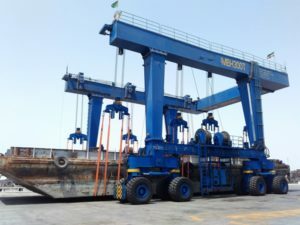 No matter what kind of marine boat hoist you want to buy, the cost of the marine trailer hoist is not the most important factor to determine whether you buy it or not. That is to say, you should not only take the price into consideration and ignore its quality. 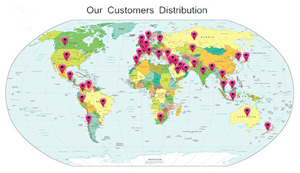 As a reputable company, Ellsen has always inherited the idea of customer supremacy, doing its best to solve for customers including technology, installation, use. Personnel training and other related issues. 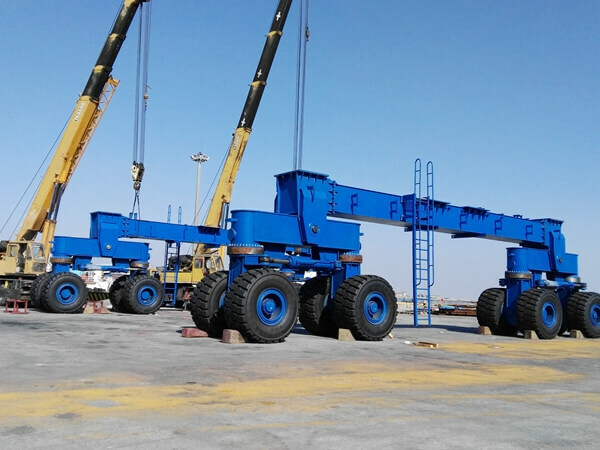 Ellsen not only has a long history, but also has a wealth of practical experience and professional technology, over the years ellsen cranes, hoists, hoists. 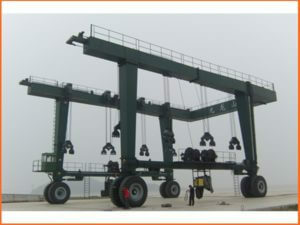 Marine lift and other products are exported to overseas, and by the customer’s praise. 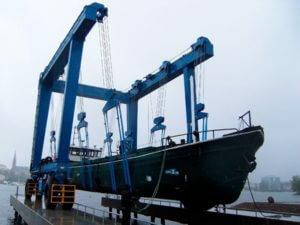 Ellsen,a professional and leading marine lift equipment supplier in China, we only manufacture high-quality boat lifts to cater for your lifting and transporting needs. Ellsen, as an industrial and trade integration company specializing in lifting equipment and construction machinery,has 55 years of industry history. 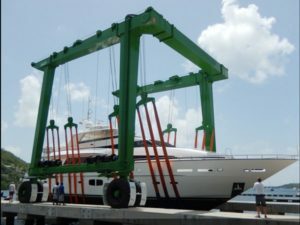 If you need customized boat lift for yacht or ship lifting and transporting, just choose and cooperate with Ellsen company that is one of the experienced and reputable hydraulic travel lift manufacturers in China. 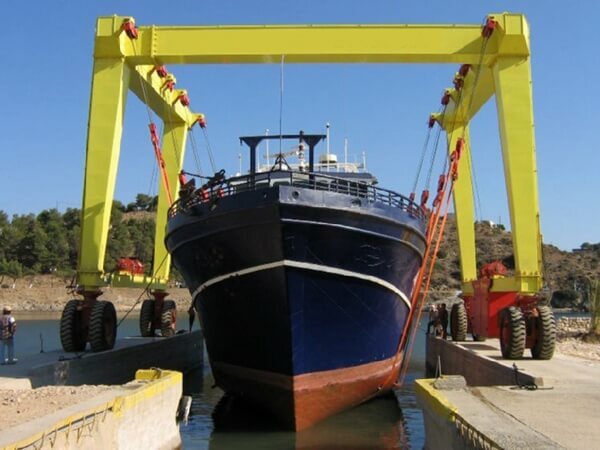 We need the following details provided to customize the marine travel boat lift: the maximum lifting capacity, overall height and width, number of straps, operation mode, etc. To know more about our travel lift and other products, please contact us and you will be provided with all details about our products.